The territory of Teramo faces the Adriatic for about 45 km, from Martinsicuro just south of the Tronto, to Silvi Marina near Pescara. In this area there are many establishments equipped for the docking of boats, pleasant walks along the promenade, shops, bars and restaurants to suit all tastes and and modern facilities.Vestiges against pirate raids are the towers of which the coast is dotted. All along this coast there are seven resorts therefore dubbed the seven sisters..or the seven pearls. These beaches are ideal for those who love gently sloping sea floors. 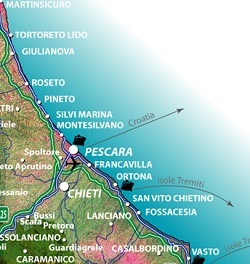 There are two marinas, Giulianova and Roseto degli Abruzzi. The first resort is Martinsicuro, whose beach is 6 km long, very interesting from a naturalistic point of view due to the presence of a coastal habitat that affects the dunes. The location is known for its wide sandy beach, the many family-friendly accommodation and a wealth of exciting nightlife venues in addition to the festivals, the cultural events and the presence of amusement parks . Immediately after, to the south is the beach of Alba Adriatica, with silver colored sand, up to 100 meters wide and 3 km long, is one of the most beautiful Adriatic coast, with well-equipped facilities. Also known as "La spiaggia d'argento" (silver beach) for the characteristic color of its sand also very fine and soft. 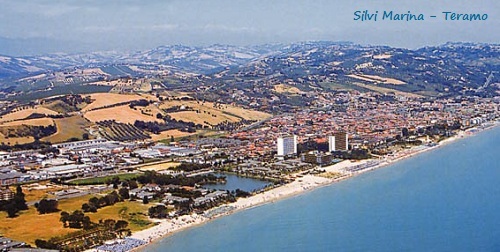 Alba Adriatica is a tourist resort leader and today is one of the most developed economic centers of Val Vibrata. Tortoreto, one of the "seven sisters" with its 3 km long beach is considered by many the area's most elegant and aristocratic location. The coast line is surrounded by undulating hills which protect it from the winds. It can be considered one of the most attractive and flourishing resorts on the Adriatic sea coast. The oldest town on Teramo coast and one of the most densely populated along with the nearby Roseto degli Abruzzi. The surrounding hills are home to several agritourism structures including some of the highest level. Roseto is a charming seaside resort situated in front of the Gran Sasso of Italy, rich in natural beauty and artistic treasures. 10 km of beach, pine forests and beautiful walks along the sea, the healthy climate and a friendly and relaxing. "The flowering beach on the sea" as it was called Roseto for lthe ingering fragrance of the oleanders and roses. 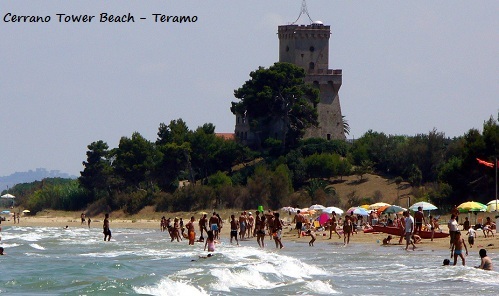 The free beach is located in the heart of the Marine Protected Area with the sixteenth century Tower del Cerrano dominating the Adriatic coast, between Roseto and Pineto beach. In the area, is also the free beach of Cologne, one of the few remaining wild and most beautiful stretches of beach along the coast of Abruzzo. It is characterized by two hectares of natural vegetation, typical of the area are ancient oak trees and Aleppo pine. Connected to the Cerrano beach, Pineto is that "place" where you go to relax. Beautiful beaches accompanied by long stretches of pine forest. Good tourist accommodation made ​​up not only by hotels but also numerous campsites. Silvi Marina the last of the seven sisters, is located at the foot of the picturesque hills of Città Sant'Angelo and Atri, very popular seaside resort both for the beautiful beach of fine sand, and for the convenience of easy access to Pescara (airport, marina, shopping centers).